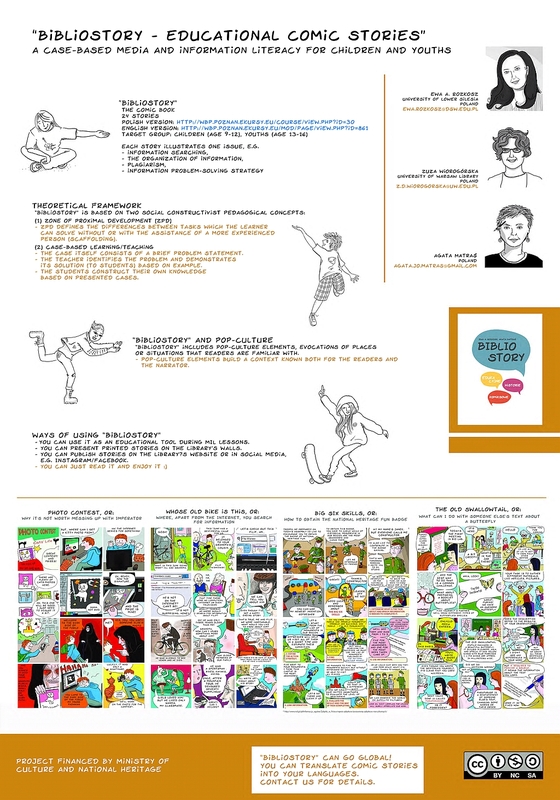 ROZKOSZ, Ewa and WIOROGÓRSKA, Zuza and MATRAŚ, Agata (2017) “Bibliostory – Educational Comic Stories”. A Case-based Media and Information Literacy for Children and Youths. Paper presented at: IFLA WLIC 2017 – Wrocław, Poland – Libraries. Solidarity. Society. in Session 112 - Poster Sessions. Our goal is to present the background and the creation process of a Polish comic book “Bibliostory—educational comic stories” as well as the sample pages of the book, translated into English. The comic book was financed by the Ministry of Culture and National Heritage and published in 2015. The Regional Public Library and Culture Animation Centre in Poznan was the coordinator of this project. Bibliostory is an example of a professional open educational resource that libraries may apply in teaching media and information (MIL) competences for children and youths. The comic book consists of 24 stories. It targets children between 9 and 12 years of age and youths from 13 to 16 years of age. Each story illustrates one issue, such as information searching, organization of information, plagiarism, and information problem solving strategy. One page is dedicated to one story only. The latter allows instructors to display the comic stories as mini-posters in libraries. In this manner, the stories may serve as ready-to-use teaching materials for MIL courses. We believe the way Bibliostory has been created, including its theoretical framework, may inspire those who are planning to create open educational resources for MIL in different countries.